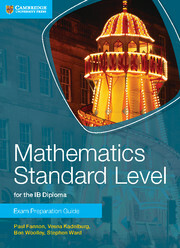 A new series of Exam Preparation guides for the IB Diploma Mathematics HL and SL and Mathematical Studies. 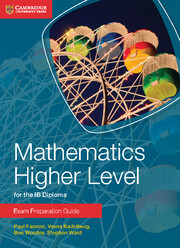 This exam preparation guide for the IB Diploma Mathematics Standard Level course breaks the course down into chapters that summarise material and present revision questions by exam question type, so that revision can be highly focused to make best use of students' time.Students can stretch themselves to achieve their best with 'going for the top' questions for those who want to achieve the highest results. Worked solutions for all the mixed and 'going for the top' questions are included, plus exam hints throughout. 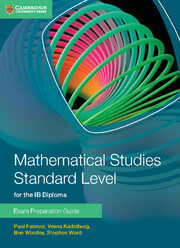 Guides for Mathematics Higher Level and Mathematical Studies are also available.